An unplanned flying visit to Melbourne the weekend before Christmas was jam packed with good things. We spent some quality time with family, we shopped a little, but most importantly we dined well. My old home town still tugs at my heart strings. I especially miss the high quality bar and dining experiences easily found in Melbourne, the intimate atmospheric haunts offering unfussy high quality food prepared and served by people who are passionate about their craft. Not one poor quality morsel of food passed our lips that weekend. One especially memorable experience was a return to an old favourite, Bar Lourinha. There are a few tables but the small space is dominated by the bar. At most, 30 people can be seated at any one time so there’s always a few hopefuls hanging about the doorway waiting for a chair. Bar Lourinha is currently celebrating 10 years of serving wonderful wine by the glass and simple rustic bar food inspired by the travels of chef Matt McConnell and his partner Jo Gamvros through Portugal, Spain, Italy and Turkey. Warmed olives and chilled white wine marked the beginning for us, then charred sourdough toast with Spanish Yurrita cantabrico anchovies served still in their can. We then chose salt cod croquettes followed by Spanish style cured Kingfish. Every morsel was superb, but the piece de resistance was a plate of simple unadorned cucumbers with a generous dollop of thick sheep milk yoghurt for dipping. I like the sophistication of Bar Lourinha, it’s self assured, honest, welcoming and friendly. The decor is quirky, the service outstanding and the food fresh, simple, thoughtful and bloody delicious. Last week, with a sense of anticipation I bought some sheep milk yoghurt, and cucumbers, Yurrita anchovies and jamon Serrano. I baked sourdough ciabatta and chose a couple of other dishes to create my own “bar” menu to serve to friends with a large jog of icy cold sangria. Feta cheese baked in vine leaves fitted beautifully into the theme. The recipe is from “Sirocco” by Sabina Ghayour. I only made a few minor adjustments to the seasoning quantities. It was delicious although a little salty due to my choice of cheese. I regret not putting a little more thought into my purchase but it didn’t detract from our overall enjoyment. The baked feta was the perfect foil to a warm salad of sweet baby carrots cooked in verjuice. I’ll share that recipe next time. 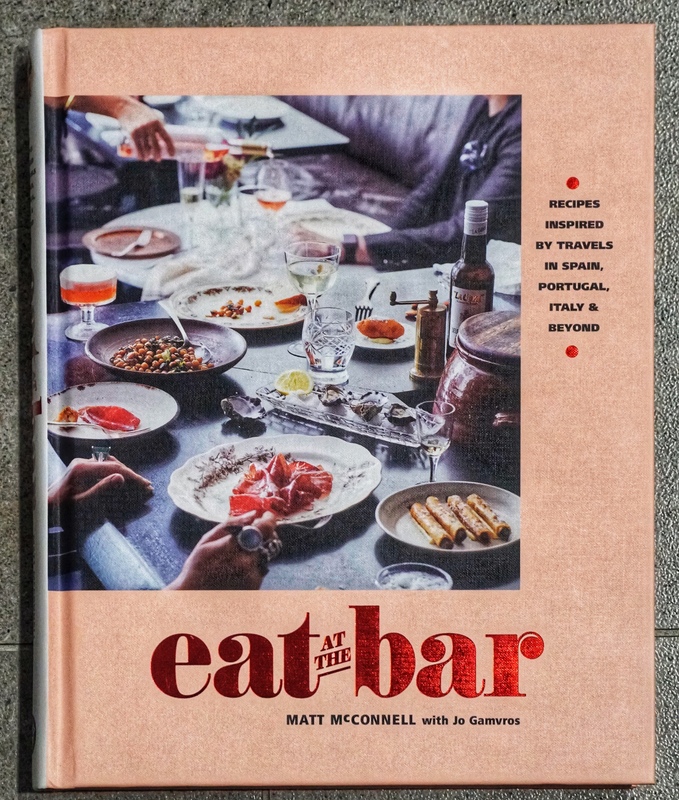 To celebrate their 10 years of success, the folks at Bar Lourinha recently published a book of recipes “Eat At The Bar.” They may be 2000 kilometres away but as a small consolation I can now recreate their delicious food at home. Preheat the oven to 200C and line a small baking pan with paper. Set one large vine leaf aside the lay out the remainder on the bench to form a rectangle big enough to enclose your block of cheese. Place the block of feta in the centre, then scatter over the herbs and spices. Drizzle over the garlic oil. Fold the vine leaves over the cheese to make a tight parcel the lay the reserved leaf over the top to seal it off. Bake the cheese for 20-25 minutes. Open the parcel and serve warm with bread. Vine leaves are available from good Greek and Turkish food stores. They are available vacuum packed or preserved in brine. Vine leaves need to be soaked for 10 minutes in a generous amount of cold water, rinsed then patted dry on a clean tea towel to reduced their salt content. If you are unable to buy vine leaves you can substitute baking paper. 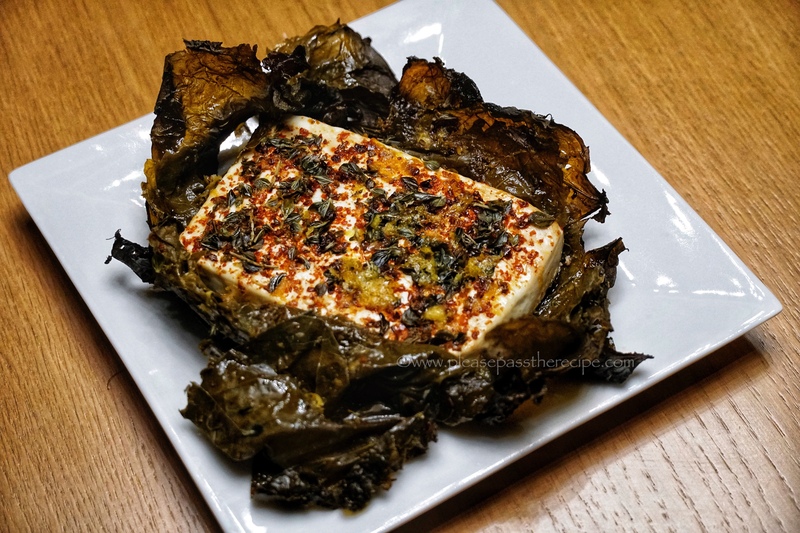 Bar Lourinha sounds wonderful, but your Feta baked in vine leaves sounds even better. I will be making this one soon. You have made me realise I should explore my own city more! I love the thought of baking feta, especially covered in those beautiful flavours. Like Francesca I have a triffid of a vine right at the back door. Could I use fresh leaves? Soak them in warm water for a little while? Any thoughts? It’s certainly a place I would love to dine and drink! The cheese sounds fabulous – i just love the seasoning. Now I have to find some grape leaves! I can only find them jarred. Don’t you use fresh? Always love reading your posts. We left Carlton end of last year and now happily ensconced in Paddington (Qld) but also part of the week in ‘Heartland .2’ near Byron. By the way have you discovered the fantastic Greek Deli in West End? I’d love to hear other places that you find worthwhile in Brisvegas – we were so spoiled in Carlton. On that note, I wanted to ask you if you had ever put together a list of all your favourite places to eat in Melbourne? We still visit often but where to eat is always hard work – too many choices! I’m sure many of your readers would love more info on what you’ve discovered. Thanks again for so many inspirational blogs. Great little recipe treat Sandra, and now I’m looking at my triffid grape vines out the back to make this. Dodoni is also my favourite fetta. But even more exciting is your return to food blogging- more please- and the book references. I’v just reserved Bar Lourinha cookbook at the Library but sadly, there are 4 in the queue ahead of me. A trip in the train to a library once a month is another New Year’s resolution. Thanks Francesca, looking back at PPTR in 2018, I really was slack! Lucky you having fresh vine leaves, do you use preserve any? I try before I buy wicth cookbooks. The library here is excellent for keeping up with new publications. No, I don’t preserve the leaves mainly because already have too many things to preserve already. Going nuts with the soft fruits right now. Hi Sandra. Good feta makes all the difference, doesn’t it. I am a fan of Dodoni. I’m actually not a great fan of plain old fetta, but this was good…. Remembering the long years when it was par for the course to take a morning flight ex Sydney. oft more than once a week, to enjoy business lunches of the wonderful, sophisticated food bounty Melbourne always seems to have had on offer – I more than understand your delight to have been back there . . The recipe is a real drawcard and vine leaves readily available on line . . . cannot wait to try . . .
😋It all sounds amazing Sandra…not that we have much choice of feta here, but I do have a few choices… which brand do you find is less salty? Oh that’s handy to know! Thank you! This entry was posted on January 10, 2019 by ladyredspecs in Baking, Cooking, Dips and Spreads, FODMAP diet, Food, Gluten Free, recipes, Savoury Baking, side dishes, Side Dishes & Salads, Snacks and tagged baked cheese, baked feta, Bar Lourinha, mezzo, tapas, vine leaves, warm cheese.